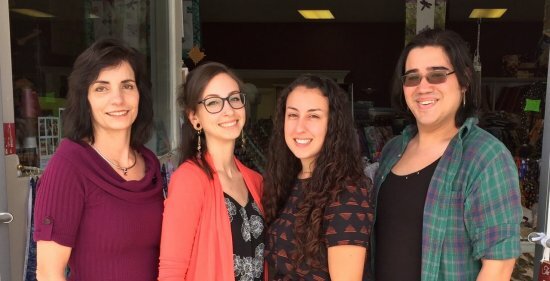 The Pin Cushion is a third-generation, family-owned business that has been serving the sewing needs of South Jersey since 1972. Our mission is to provide quality fabric and supplies with excellent customer service. Our passion for excellence is what inspired us in the beginning and it's what continues to drive us today. Throughout the years, we've maintained strong relationships with our customers and the community. We strive to go beyond a conventional retail store by promoting creativity and giving back. In that spirit, we now offer a variety of classes and actively participate in fundraisers/events for non-profit organizations. We've worked with Ryan's Case for Smiles, Quilts of Honor, The American Cancer Society's Relay for Life, and Project Linus. We've also hosted an event for Pillows for Paws - a non-profit organization that creates toys and beds for local shelter animals. These comfort items play a crucial role in promoting emotional well-being, assisting in behavioral issues, and ultimately, increasing the animals adoptability. Currently our store carries a wide variety of premium fabric: bridal, children's, drapery, dress, headliner, home dec., quilting, upholstery, and clear/colored vinyl. We also offer notions, patterns, foam, ribbon, needlework supplies, and yarn. We pride ourselves on our detail-oriented nature. Using our hands-on experience, we help our customers in whatever project they may be working on! Stop by and see our large selection!